My Top 5 Favorite things – at the T-Hee store in Dallas! 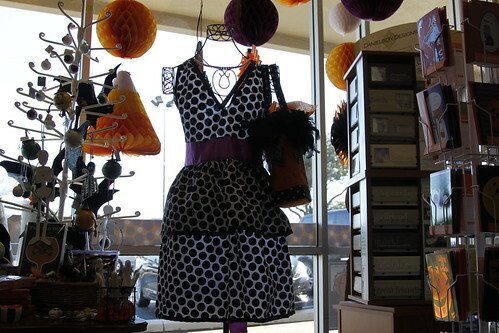 Last weekend I got a super fun invite to go check out an adorable store in Dallas called T-Hee! It was a blogger get together as well, and gave me a chance to meet in person some bloggers who I only knew online! And a chance to see some bloggers I haven’t seen in a while. Why we chatted we checked out the store – and there were PLENTY of super cute things! 1. How adorable are these “Happy Everything” platters and cookie jar? The unique twist is that they have some velcro on the front that allows you to switch out the holiday decorations so that they are festive for everyday, but also EVERY possible holiday! 2. 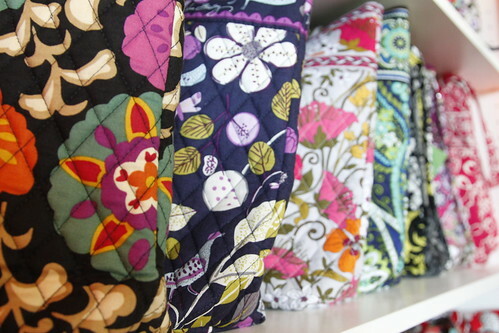 I just love all the pattern possibilities of Vera Bradley! Am I the only one that just gets the warm fuzzies from pretty colors and flower designs?! 4. Ever wish you could have Glinda the good Witch or like ya know…ELVIS at your party?!? It can happen with their super funny cut outs! 5. Super cute retro Apron! I love retro stuff, especially 50’s looking stuff! A-D-O-R-A-B-L-E! And here are a couple pictures of some of the super sweet bloggers I ran into at the store! You can check out T-Hee for yourself at 6465 E Mockingbird Lane, Suite 314, Dallas, TX 75214. Swing by their Facebook page, or order from them online! What a fun invite, right? Special thanks to Holly from She is Dallas for including me! And to T-Hee in Dallas for hosting all of us bloggers with such a wonderful welcome! A Galleria Dallas Christmas: Holidays in DFW 3 totally FREE Ways to Experience Disney Magic – at a Disney Store! The Container Store – Giveaway! HMK Store Haul & Giveaway! That looks like a fun night. I was bummed that I missed it, but a flat tire at the State Fair of Texas kind of derailed my plans. @JamieAnne, Oh my goodness! Really? Thats crazy! Hope it got fixed fast- what a pain! This really looks like a wonderful shop to explore. @JDaniel4’s Mom, It really is- lots of super unique gifts! @rose, Yes! So fun to meet other bloggers!